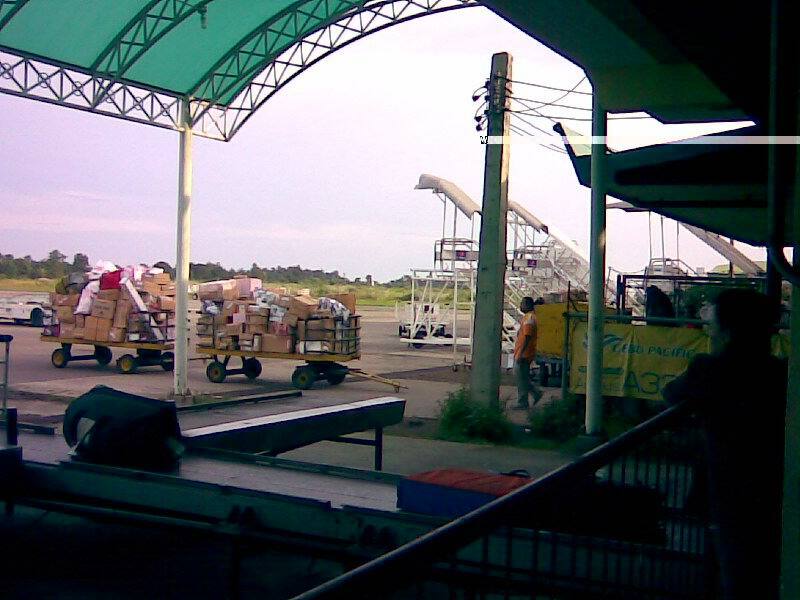 To continue with our feature of Philippine airports, I am posting photos on the airport in Cagayan De Oro City collected over the past few years. The airport is curiously located on a plateau making it difficult to expand the airport, particularly lengthen the runway to accommodate larger aircraft. The airport is also plagued by poor visibility due to its elevation, which makes it prone to fog during the wet season. I am a frequent user of the airport due to trips to Iligan City where we have research and extension involvement with MSU-IIT and the City Government of Iligan, mostly to promote environmentally sustainable transport. MSU-IIT and UP Diliman are also among the partners in the DOST’s Engineering Research and Development for Technology (ERDT) program together with Ateneo De Manila University, DLSU, UPLB, Mapua, CLSU and Cebu’s University of San Carlos. Following are photos from a trip to Iligan City back in September 2007. 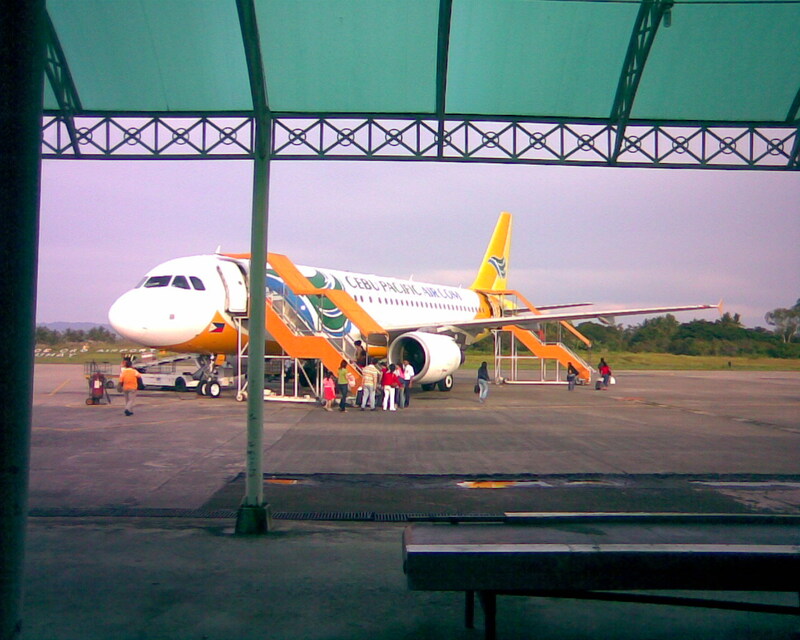 The gateway to Northern Mindanao, we usually travel to Iligan City via Cagayan De Oro. 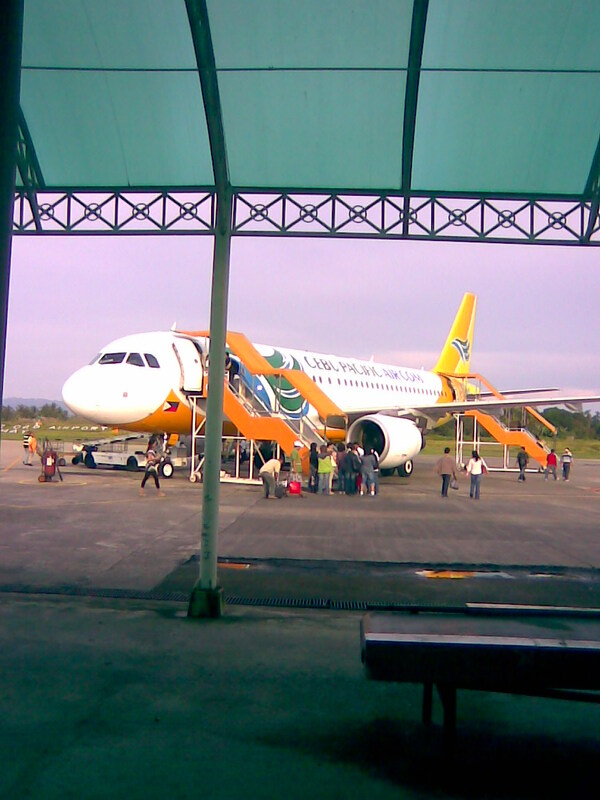 Cebu Pacific plane waiting for boarding. Baggage to be loaded on the plane. 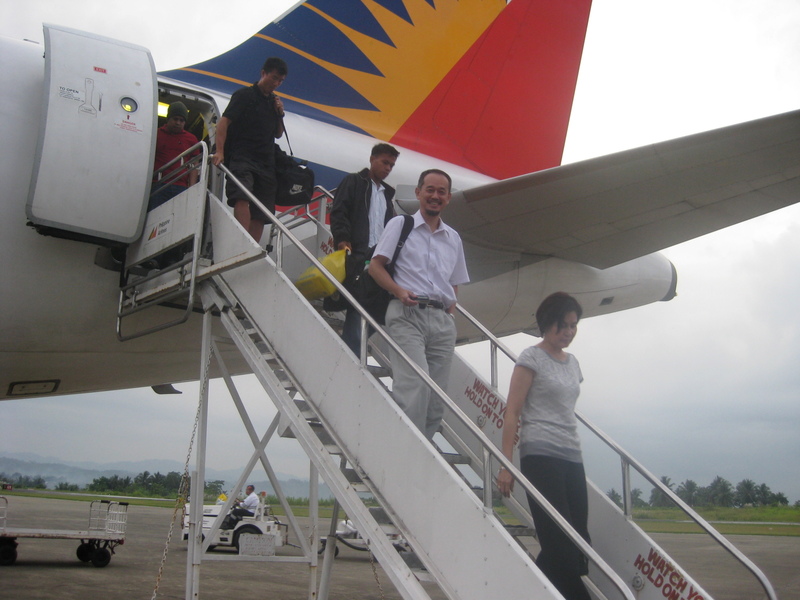 CebPac Airbus A320 boarding passengers. Waiting for our baggage at the arrival area. Here it comes and to be loaded by porters unto the conveyor system. I haven’t seen mishandled baggage so far from my trips to this airport. 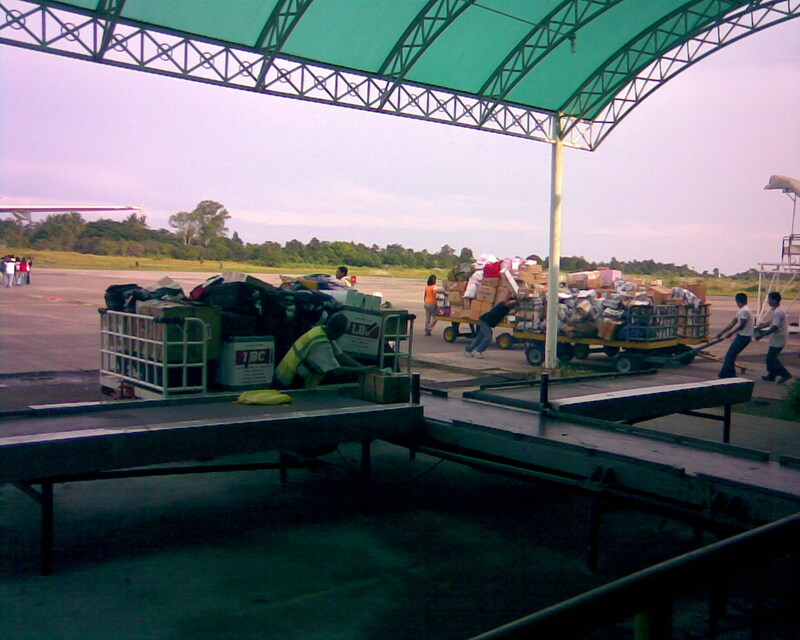 Luggage and other baggage are placed on a conveyor. I was able to take photos on a September 2009 trip to Iligan City. This was only a couple of weeks before Ondoy (Ketsana) inundated Metro Manila and much of its surrounding areas. 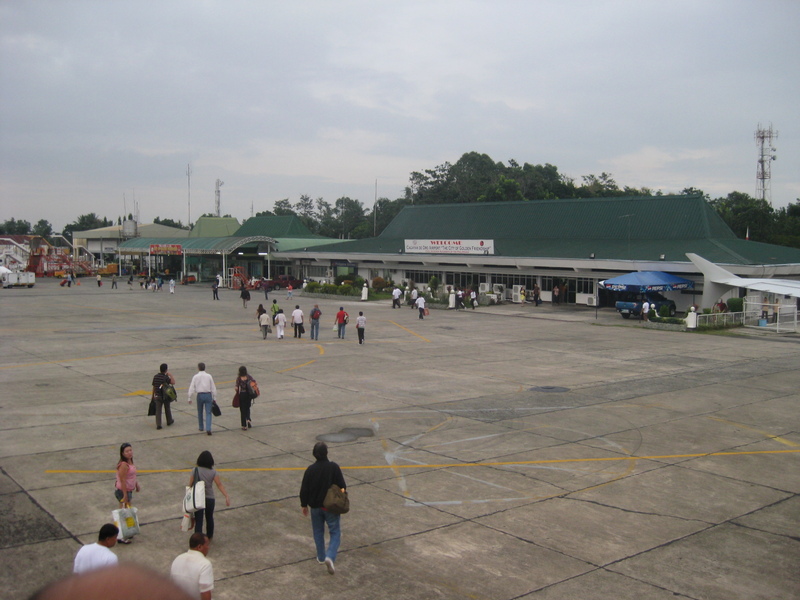 The CDO airport passenger terminal as viewed from the aircraft. 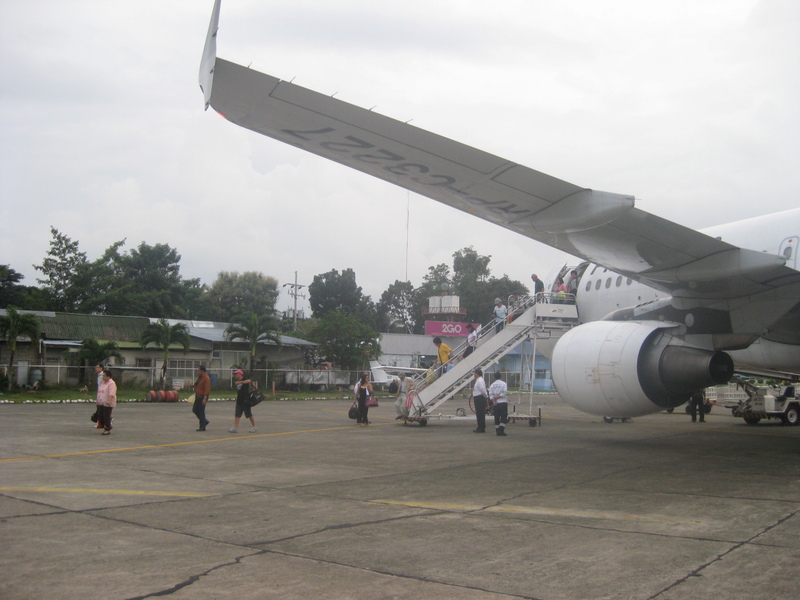 Passengers deplaning from the aircraft’s rear (aft) door. That’s Prof. Tetsuo Yai of Tokyo Tech smiling as he descends from the plane. PAL’s staircases actually look more sturdy than the makeshift ones used by CebPac. 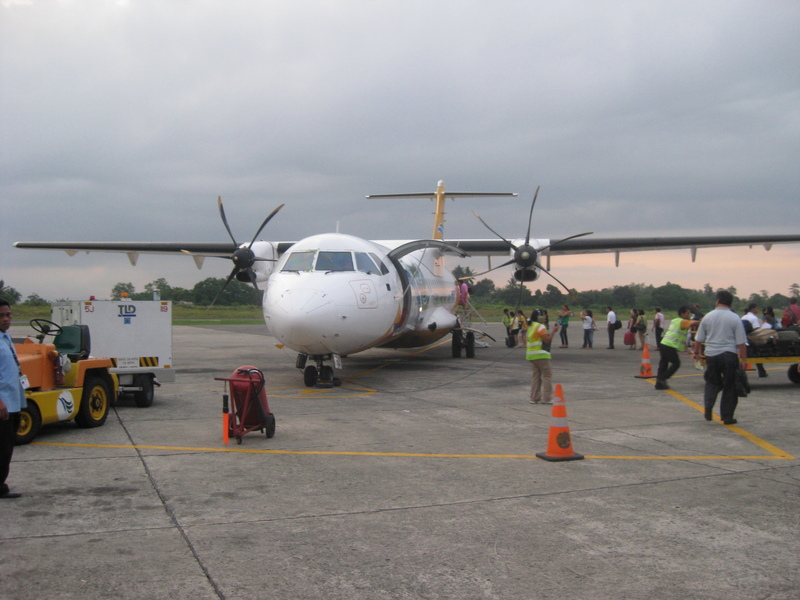 Ceb Pac turbo prop aircraft (ATR 72-500) loading passengers. These aircraft typically serve shorter routes like CDO-CEB or CDO-DVO. 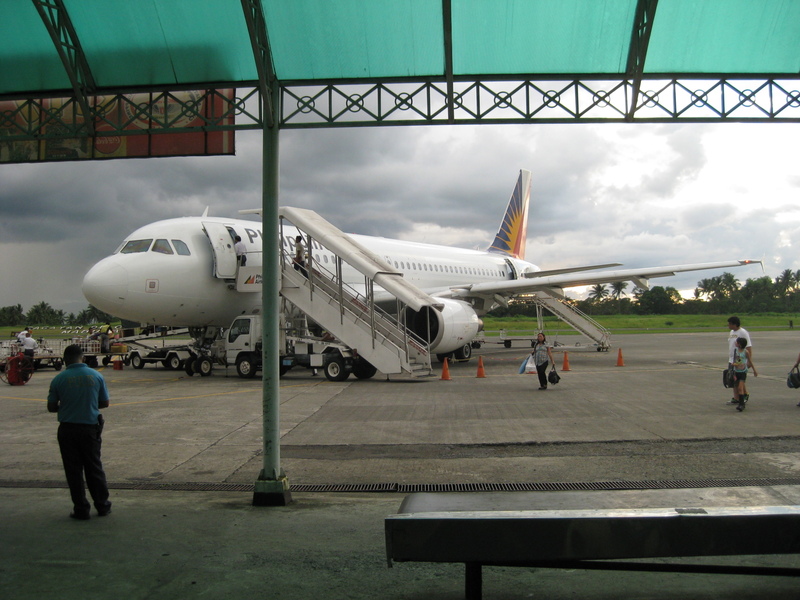 Jet aircraft (A319, A320 or A330) usually services the longer domestic routes like CDO-MNL or DVO-MNL. 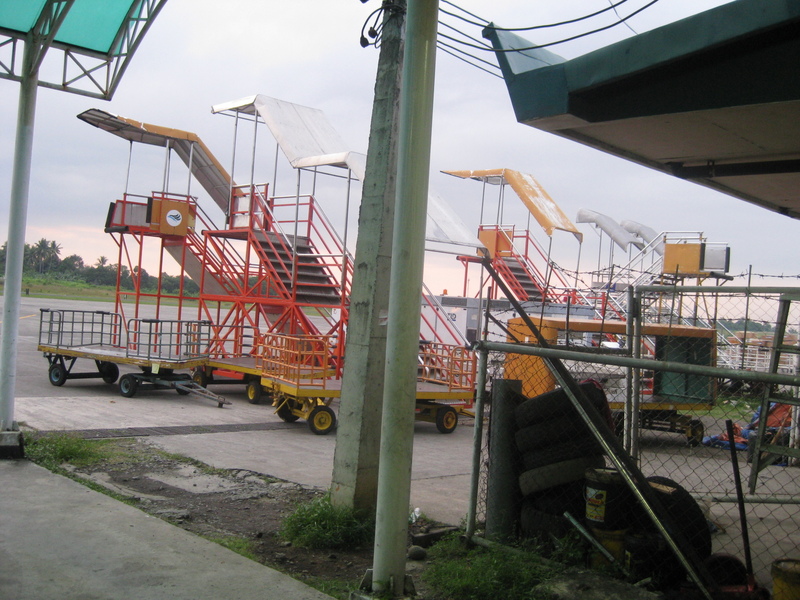 The stairs seem to be waiting for the next plane to serve. 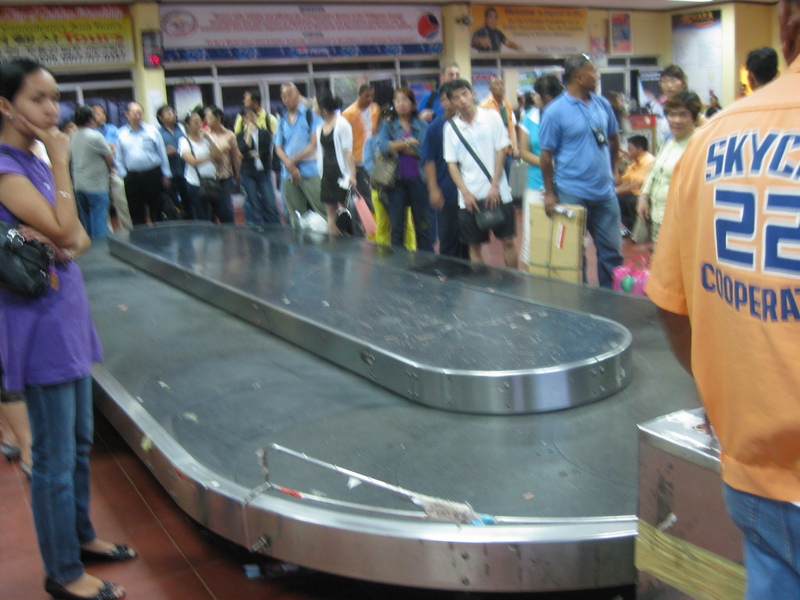 Passengers gather around the conveyor for their baggage. The following photos are from a more recent trip to Iligan (July 2010) via CDO. At the time, we held a seminar/workshop at MSU-IIT on EST that focused on the application of a road accident database system developed by NCTS for the DOTC. 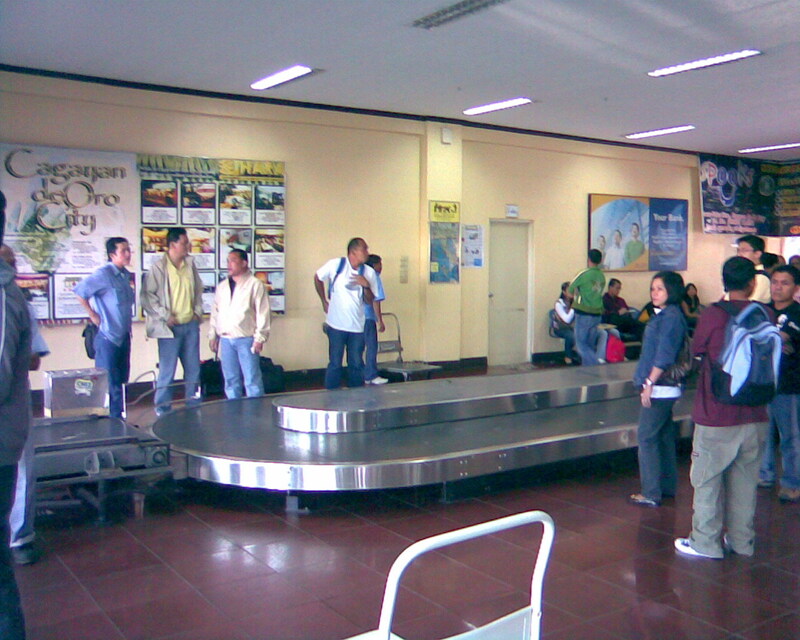 After deplaning, passengers walk towards the terminal. People are supposed to be prohibited from walking along the area under the aircraft’s wings so security typically lay down traffic cones for this purpose. 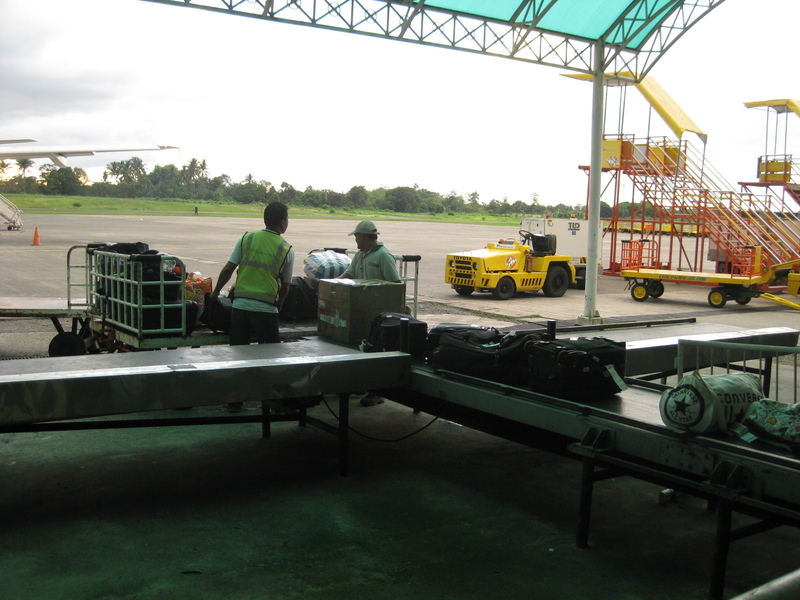 Baggage handling is the same as in 2007. 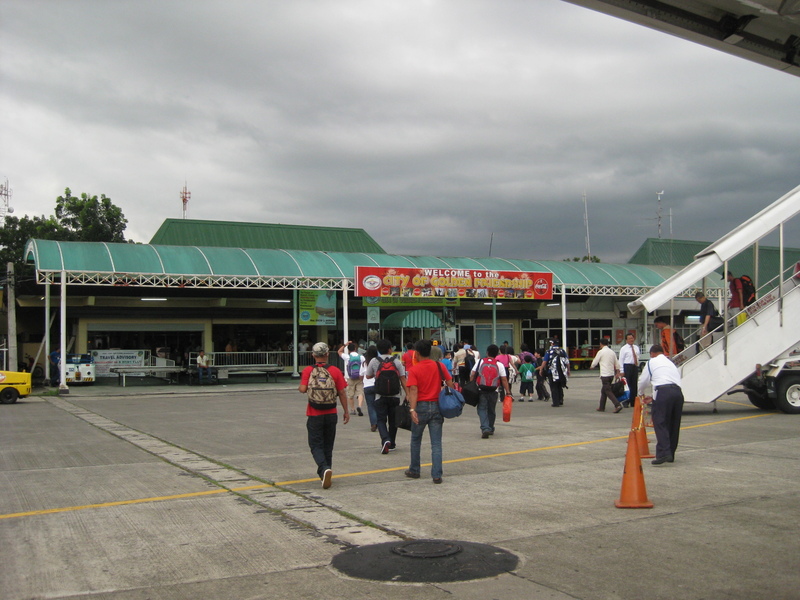 From 2012, or perhaps 2013 if delayed, the main airport for Northern Mindanao will be transferred to Laguindingan town, a few minutes away from CDO. The region, after all, deserves a bigger and better airport. 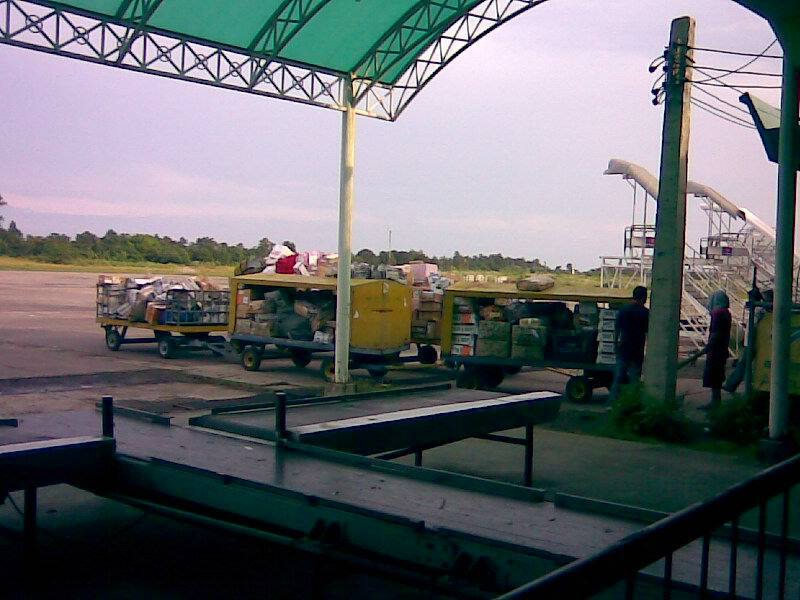 The land where current airport is located will most probably be sold or leased out, similar to what was done to Iloilo’s airport in the Mandurriao district of that city. I am quite curious if the Laguindingan airport construction was affected by the recent floods brought about by Sendong (Washi). That storm laid waste to large areas of Northern Mindanao and particularly costing the lives of more than 1,000 people based on the latest reckoning. It is hoped that Northern Mindanao and other areas affected by the recent calamity would be able to recover and quickly. The people are resilient and hopeful, and should be aided for them to be able to rise from this terrible experience, a tragedy of the highest magnitude. By d0ctrine in Airports, Infrastructure on December 23, 2011 .